On 01 April 2010 a group of seven set off from the UK for the German city of Trier. This was the centre of operations for a steam festival - dampfspektakal - celebrating the 175th anniversary of the first railway in Germany. In addition the event celebrated 20 years of Plandampf operations in Germany. It was quite a feast of steam. Saarbrücken - Trier - Koblenz with steam on extra semi-fast trains. 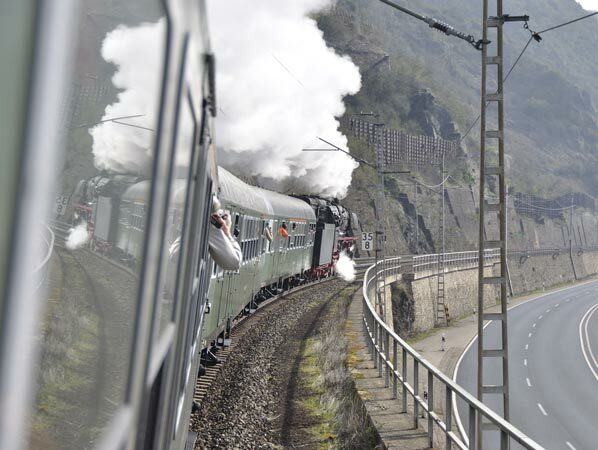 Saarburg - Trier - Bullay or Cochem with steam on extra local trains. Trier - Köln with steam on regular service trains. 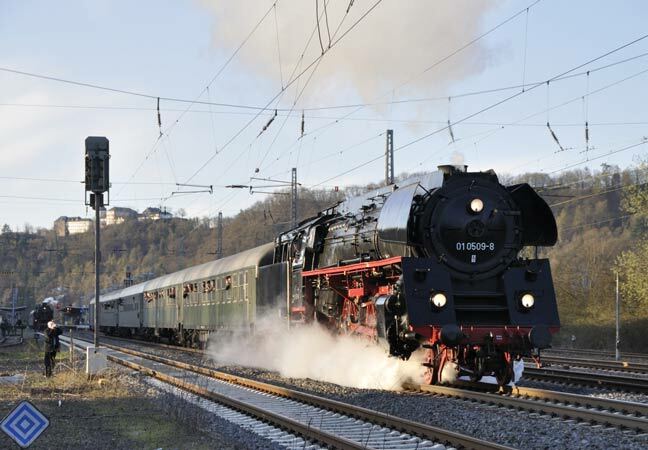 Trier - Gerolstein with steam on extra local trains. Gerolstein - Ulmen with steam on local trains. Gerolstein - Gerolstein depot shuttles. 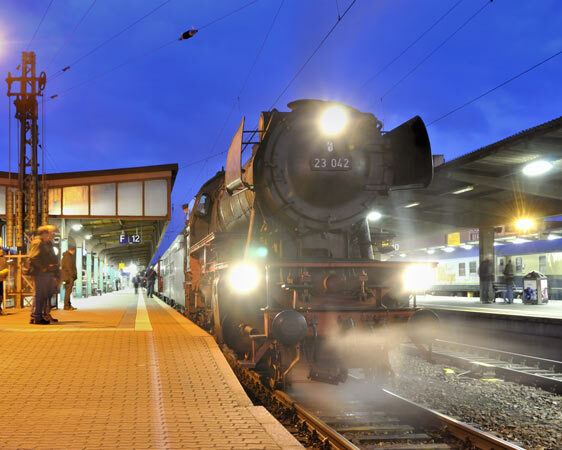 Luxembourg - Trier with steam on extra local trains. Brohol - Engeln narrow gauge steam. Gerolstein depot was open to visitors during the festival as was the railway museum in Koblenz. Click here to view a route map. It didn't prove possible to achieve haulage by every engine or over every route, there was just too much going on all at once. I am sure some will have managed it but our plans weren't that sophisticated! That said we packed a great deal in and had an excellent time. Bath Spa to London Paddington with First Great Western. London St Pancras International to Bruxelles Midi with Eurostar. This trip was achieve in a little under 12 hours and went smoothly other than the dash at Bruxelles Midi after a last minute platform change from 13 to 4. Thanks to SNCB for that and our sincere thanks to the local chap who told us otherwise we would have missed it. Our return, on 06 April, was by the same route in reverse. Below a series of photo galleries, one for each day, are presented. The image size is 940 pixels along the short edge but will resize to fit browser windows, file sizes are generally in the region of 200-300kb. We travelled on the 09:00 Trier - Koblenz and return 15:30, both with 01 1066. Back at Trier we awaited the arrival at 17:12 of Prussian P8 2455 from Gerolstein, but it never appeared. The following train, due in at 19:12, was a little late but did appear behind 78 468. Click here to view the photo gallery for this day. A very early start to get the 05:32 service train from Trier to Köln Deutz. Here we picked up 01 509 on the 09:15 Plandampf for Trier, travelling as far as Gerolstein. At Gerolstein we changed plans having missed our planned 11:25 departure which was leaving as 01 509 pulled in. It was just as well we missed it. The change of plan allowed us to visit the depot before travelling to Daun and back on the heavily delayed 13:25 hauled by 50 2740. The train should have gone to Ulmen but, very sadly, a trainee fireman had been run over on that section preventing its use. Unfortunately the trainee fireman died the next morning in hospital. We returned to Trier from Gerolstein behind 23 042 on the 17:34 train..
At Trier we waited for the arrival of 01 118 on the 19:19 arrival from Koblenz. Sensible people stayed in bed this morning but I got up for the early trains. I was at Trier Hbf for just before 06:30 to photograph 23 402 before it set off for Gerolstein. I joined the 06:40 service to Bullay behind 41 360. At Bullay this was overtaken by 01 509 hauling what I understand was a high speed run to Koblenz. The railcar shuttle to Traben-Trarbech was also seen at Bullay. I returned to Trier with 41 360 where I was joined by everyone else for the run out to Saarburg. Here we opted to photograph 41 360 setting off for Bullay and awaited the arrival of 01 118 from Saarbrucken for our train on to Trier. The plan then had us on 01 509's train, from Koblenz, to Saarbrücken and back. 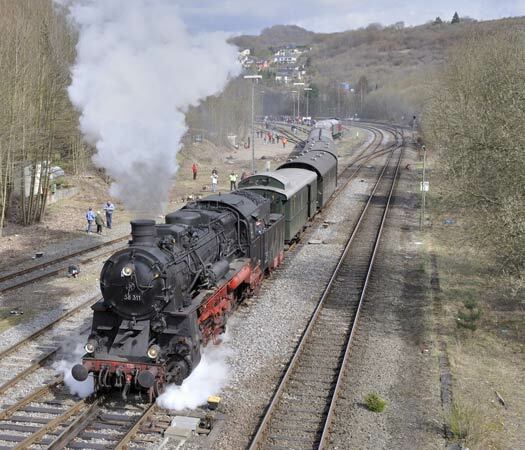 Due to late running we opted for a trip behind 50 3610 to Saarburg via Igel, which allowed the locomotive to be turned. From Saarburg we caught a service train on to Saarbrücken for the return to Trier with 01 509. Back at Trier we watched the various arrivals which all terminated here with the trains heading to shed afterwards. 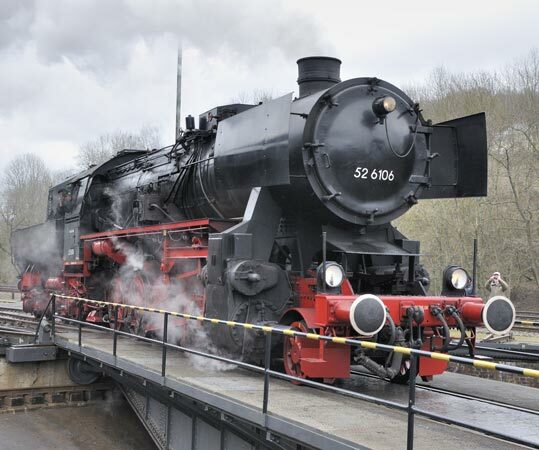 We saw arrive from 41 360 from Saarburg, 23 042 from Gerolstein and 01 118 from Koblenz. Originally this day was planned to be spent around Trier watching trains and taking the trip to Luxembourg. In light of our failure to get to Ulmen over the steeply graded branch and the amount going on at Gerolstein 4 of us, myself, my father, Huw and Stuart, opted to head back there with Nigel and Alistair, who were taking part in a Gerolstein based plandampf the next day, opted for something approaching the original plan. Keith wanted to spend the morning in Trier looking around before coming to Gerolstein in the afternoon. Having not been entirely happy with the early morning photos taken the day before I Trier I returned for another go and was joined by the others for the rather busy 08:27 to Gerolstein behind 78 468. Busy trains were to be the theme of the day. At Gerolstein we attempted to get on the 52 6106 hauled 10:25 to Ulmen on platform 5. The train provided, 6 coaches and 1 van, had nowhere near enough accommodation for the platform full of people. Having failed to get on it was announced the train would transfer to platform 2 where more coaches would be added. In addition to extra coaches 3 more locomotives were added - KPEV T11 2-6-0 7512 and, in the middle of the formation, 2 diesels. The train which set of was thus made up of 4 locomotives and 18 vehicles! We were lucky enough to ride near the front in some very historic, and beautifully restored, KPEV 4 wheel wooden coaches. We returned to Gerolstein from Ulmen on the (nominally) 12:00 departure behind 52 6106 hauling 10 coaches banked by a V100 diesel. This train too was absolutely crammed full as it appeared most of Ulmen's population wanted to get on it. The situation was made more chaotic at Daun with yet more passengers! Back at Gerolstein, where the station was struggling to cope with the number of people, there was general chaos but lots of trains to watch. These included the depot shuttles, Ulmen departures and arrivals behind 50 2740, 58 311 and 52 8134 whilst running a little behind time 01 1066, renumbered as 012 066, was seen hauling the Trier - Köln Plandampf. The late running 01, Stuart, Huw and Keith being at the depot and the chaos at Gerolstein station meant we missed the 15:34 run to Trier behind P8 2455 Posen instead opting to take the 16:17 service train back to Trier, which itself was pretty busy. As on previous evenings, but this time in glorious light, we watched various arrivals and departures with locos 5519, 41 018, 01 509. 2455 Posen and 23 042 providing the entertainment before the sun dipped too low.